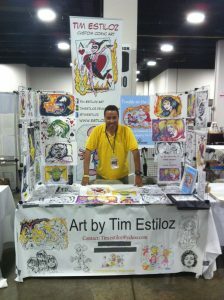 Tim Estiloz is an experienced artist, cartoonist, published children’s book illustrator and an Emmy winning television journalist who loves to draw.. His early comic book experience includes inking the titles Speed Racer, The New Ghostbusters, Married With Children and more. His hand rendered watercolor illustrations appear in the children’s book, Trouble On The Loose. Tim’s traditional inking work has been featured twice in the published Joe Sinnott Inking Challenge and the current Ms. Inkwell Pin-Up Gallery book. He has also worked as a cartoonist, storyboard artist and illustrator for a variety of Boston area newspaper publications and magazines; as well as several greeting card companies and corporate advertising. Tim also loves drawing for kids and works as an "Artist In Residence" at Boston Childrens Hospital where he weekly entertains and uplifts young patients by drawing superheroes and Disney characters for them at their bedside.